» Super Bowl Wrap-up: What Was Pete Carroll Thinking? We’ll never understand it. I can explain some of the logic behind Seattle’s now infamous second-and-goal play call. I can show you why Russell Wilson threw the pass. I can point out why it might not have been quite as awful a decision as it seemed immediately afterward, when we judge such choices almost entirely based on their outcomes. I’ll even get to how Bill Belichick nearly screwed up the situation before being bailed out by his team’s fifth cornerback. I’ll do all that. You will probably never understand why the Seahawks just didn’t hand the ball to Marshawn Lynch in that situation and worry about trying anything else later. Truthfully, neither will I.
I don’t think passing the ball was the right decision, but let me try to put together a case in which it might be a justifiable choice. After the game, Pete Carroll suggested that the Seahawks didn’t want to leave the Patriots any time for a last-ditch drive after Seattle’s seemingly inevitable touchdown. Granted, Carroll suggested his team was “… playing for third and fourth down,” which seems a little bizarre given that the Super Bowl was on the line, but I’m willing to give his ability to formulate coherent words 30 minutes after that play happened the benefit of the doubt, given that I was watching the game at home and could barely form meaningful sentences at what I had seen. You can understand why Carroll might be afraid of getting burned in what seemed like a hopeless situation for the opposition, because you only have to go back to Seattle’s last playoff loss to remember how quickly things can swing. That was during the 2012 playoffs, when the Seahawks came back from a 27-7 deficit in the fourth quarter to take a 28-27 lead with 34 seconds to go. In that game, the Seahawks handed the ball to Lynch on first-and-goal from the 2-yard line, and he immediately scored. Despite the stunning comeback, Atlanta got the ball back with two timeouts, completed a pair of passes, and got a 49-yard field goal from Matt Bryant to win the game. The Packers, furthermore, responded to another huge Seattle comeback by taking over with 1:19 left and driving for a game-tying field goal in the NFC Championship Game. I’m not arguing that Carroll and offensive coordinator Darrell Bevell should have been so time-conscious as to basically waste second down on a pass play. But I can understand why they would be overly sensitive about leaving too much time on the clock. If you’re thinking about the game coming down to those three plays, you can also piece together a case that second down is the best time to throw the ball. As Wilson took that fateful second-down snap, there were 26 seconds left and Seattle had one timeout. Let’s pretend for a moment that the Seahawks decide to run the ball on second down. If they don’t get it, they have to call timeout, probably with about 22 seconds left. That means they’re stuck passing on third down with virtually no chance of running the ball, because it would be too difficult to line up after a failed run. On the other hand, by throwing on second down, you could get two cracks at running the football while providing some semblance of doubt for the Patriots. If Wilson’s pass on second down is incomplete (and he avoids a sack, which seems likely given his ability to scramble), the clock stops with something like 20 seconds to go. That means you can run the ball on third down, use your final timeout, and then run the ball again on fourth down. All three plays come with the possibility of either throwing or running, which prevents the Patriots from selling out against one particular type of play. You might argue that the logic there doesn’t include the danger of throwing the football and the downside of an interception, and that’s true, but there are negative possibilities in every play call. In fact, this season it was more dangerous to run the football from the 1-yard line than it was to throw it. Before Sunday, NFL teams had thrown the ball 108 times on the opposing team’s 1-yard line this season. Those passes had produced 66 touchdowns (a success rate of 61.1 percent, down to 59.5 percent when you throw in three sacks) and zero interceptions. The 223 running plays had generated 129 touchdowns (a 57.8 percent success rate) and two turnovers on fumbles. Stretch that out to five years and the numbers make runs slightly superior; they scored 54.1 percent of the time and resulted in turnovers 1.5 percent of the time, while passes got the ball into the end zone 50.1 percent of the time and resulted in turnovers 1.9 percent of the time. In a vacuum, the decision between running and passing on the 1-yard line is hardly indefensible, because both the risk and the reward are roughly similar. The key phrase there, of course, is “in a vacuum.” This wasn’t a vacuum. This was the Seahawks and the Patriots, and while the size of the stage shouldn’t matter, the matchups should. As I mentioned in my Super Bowl preview, this was a matchup specifically built for running the football with Lynch in short yardage. According to Football Outsiders, the Patriots were the worst team in the league in power-running situations and fifth-worst in terms of stuffing the opposition for no gain or a loss. Seattle was the second-best power running team and the sixth-best team at avoiding stuffs. If there was ever a matchup that called for a team to live and die on the back of its running game from the 1-yard line, this was it. While Lynch had been stopped on an early third-and-2 and a red zone third-and-1, the latter came on a zone-read play where Wilson made a mistake (more on that later). Lynch also converted a third-and-2 from the 3-yard line earlier in the game for Seattle’s first touchdown. It’s also fair to say that running the football with Lynch is the fundamental identity of Seattle’s offense; this is not a team built or designed to win with slants in the red zone. Lynch hasn’t been automatic from the 1-yard line in Seattle — he’s actually converted only five of his 12 tries from one yard out over the past three seasons — but, once again, this was no normal situation. Carroll claimed after the game that the Patriots were in their goal-line package and that the Seahawks, who came out with three wide receivers, were right to throw the ball and basically waste a play against a mismatch of personnel. I’m not sure I see that, and Belichick confirmed as much after the game. The Patriots did line up with a combination of eight defensive linemen and linebackers in the box, seven of whom were on the line of scrimmage at the snap, but they also played three cornerbacks — Malcolm Butler, Darrelle Revis, and Brandon Browner — against Seattle’s three wideouts. The space you see in the screenshot makes Ricardo Lockette seem more open than he actually is — Butler has already identified on the route and he’s going to drive on the football — but it’s not as if Wilson made a dangerous throw into traffic. If the Seahawks really wanted to waste a play, as Carroll was suggesting, Wilson could have thrown this into the ground or thrown it through the back of the end zone.1 He didn’t because they got the exact look they were hoping for. In terms of execution, I’d assign more blame to Lockette, who got beaten to the spot and knocked to the ground by Butler, a player Lockette outweighs by 20 pounds. As galvanizing as it’s been over the past 12 months for the Seattle wide receivers to contrast their no-name status with their success, this was a game when the team’s need to upgrade at receiver was clear. Doug Baldwin was held to a lone three-yard touchdown catch against Revis. Jermaine Kearse dropped a dime from Wilson on a critical third-and-2 in the third quarter on a play in which Bevell curiously decided to motion Lynch out of the backfield and split him wide instead of leaving him behind Wilson to at least represent a run threat. Luke Willson went catchless. And Lockette, who has 18 catches in four seasons, was the primary target on the game’s biggest play. Seattle’s star wideout in this game was Chris Matthews, who hadn’t caught a single NFL pass before Sunday. The Seahawks might not have specifically missed Percy Harvin, but they missed having a wideout of Harvin’s caliber to give Revis any trouble. They really could have used Golden Tate. What makes the decision to throw even more difficult is that Belichick might have let the Seahawks walk in for a lead-taking touchdown. With the ball on the half-yard line and New England up four points, it quite possibly would have been better for the Patriots to allow Seattle to score while leaving Tom Brady as much time as possible to try to set up a game-tying field goal attempt from Stephen Gostkowski. Most coaches wouldn’t even think about such a move, and Belichick would have needed to communicate it to Dont’a Hightower to tell the team in real time, but it’s exactly what Belichick did against the Giants in Super Bowl XLVI, when he allowed Ahmad Bradshaw to plunge into the end zone. It isn’t quite as clear-cut as that situation several years ago. Brian Burke, who thinks about this stuff as much as anybody, suggested after the game that teams should never allow the opposition to score when they’re up by four points or more, presumably because they can still win by stopping the opposition. The Giants were down only two points when Belichick let them score; they could have run the clock down and kicked what amounted to an extra point to win it. If Belichick had really wanted to let Seattle score and conserve as much time as possible, he would have also used one of his final two timeouts after the first-down run. It was downright baffling that he chose not to do so. Given that Seattle had the ball inside New England’s 1-yard line with a minute left, extending the clock mattered far more to New England than it did to Seattle; that’s why the Seahawks were milking as much clock as possible. Calling timeout could have changed things dramatically. If Seattle then ran the ball on second down and Lynch scored, the Patriots would have taken over with about 50 seconds left and a timeout. In reality, with Belichick not calling timeout and the Seahawks running the clock down, a Lynch plunge would have handed New England the ball back with about 15 seconds and two timeouts to go. Even if he’s not trying to let the Seahawks score, Belichick has to use his timeouts in the hopes of conserving time if they do punch it in. If the Seahawks score, we’re all writing about how Belichick’s mind went blank at exactly the wrong time. Burke’s model suggests that the Patriots would have seen their win expectancy fall from somewhere in the mid-teens to about 9 percent after a Seahawks touchdown and ensuing touchback, even if New England had used its timeouts properly. In terms of one play swinging a team’s chances of winning the Super Bowl, the second-down interception was probably the most important in the history of the NFL. Burke’s Advanced Football Analytics model suggested after the game that the Patriots’ chances of winning jumped from 12 percent before the interception to 99 percent afterward, for a swing of 87 percentage points. It’s difficult for one play in any context to shift things that dramatically. The Mike Jones tackle of Kevin Dyson at the 1-yard line in Super Bowl XXXIV came to mind, but that was a 23-16 game; even if Dyson had gotten in, Tennessee’s chances of winning would have risen only to about 50 percent, since the two teams would have gone to overtime (or Tennessee would have attempted a two-pointer, which would also have put its chances of winning near 50 percent). The most meaningful play before this one was probably Scott Norwood’s missed 47-yard field goal in a 20-19 game at the end of Super Bowl XXV, but there’s no way he had an 87 percent chance of making the game-winning field goal to begin with, so even reducing Buffalo’s chances to zero wouldn’t match Wilson’s interception. OK. After all of that, to put a label on it, it was a bad decision with a horrific, life-changing outcome. It wasn’t the worst choice a head coach or an offensive coordinator has ever made, especially in a league where the bar for in-game tactics is so conservative and so low.2 The vast, vast majority of the time, the negative outcome for that pass play is an incompletion on which Cris Collinsworth wonders aloud about giving the ball to Lynch and we forget about the play altogether. If Lockette catches the pass, there’s not a soul on earth wondering why they didn’t hand the ball off. Alternately, if Lynch is handed the ball and fumbles — something that was about as likely as an interception in that situation — the outcome’s just as awful. Throwing the ball was a subpar idea. The Seattle Seahawks throwing the ball against the New England Patriots in that situation and that spot was a much worse idea. No explanation has sufficed or will. In a game that relied heavily on the back of each team’s depth chart, it was fitting that New England’s fifth cornerback came up with the play that decided the contest. Butler, an undrafted free agent who signed with the Patriots this May and had all of 199 defensive snaps under his belt before Sunday, was credited by NBC with allowing two catches for 36 yards on six targets. Those numbers fail to tell the story of how topsy-turvy his performance actually went on the field. When Butler came in during the second half, he spent most of his time on the combination of Kearse and Lockette, getting away with two fortunate breaks before his late-game heroics. He was in coverage against Kearse on that third-and-2, with the third-year Seahawks wideout beating Butler on a corner route and Wilson lofting a perfect pass over Butler’s arms, only for Kearse to drop the pass and likely cost the Seahawks three crucial points in the process. Two Seattle series later, Lockette beat Butler on a dig route and would have had a big gain, but a slipping Butler managed to snag Lockette’s ankle and bring him down as the pass was being thrown. Butler should have been whistled for pass interference, but he got away with the would-be penalty. He wasn’t so lucky later. The Seahawks repeatedly went after Butler on the final drive, and Butler responded. He knocked away a pass up the seam to Kearse, and when Kearse ran a deep corner route with 1:14 left, Butler was again able to tip the pass away, only for the ball to stay in the air long enough for Kearse to make a miraculous reception on the rebound while lying on his back. It would be harsh to blame Butler for that 33-yard completion, but the numbers say as much. Butler was in the contest only because the Patriots benched slot cornerback Kyle Arrington, who had a horrific Super Bowl. Spending most of his day suiting up against the 6-foot-5 Chris Matthews, the 5-foot-10 Arrington was overmatched and gave up a number of big plays. Matthews beat Arrington downfield for Wilson’s first big completion of the game, a 44-yard bomb on which Arrington lost sight of the football and could have been called for holding. That set up Lynch’s game-tying touchdown three plays later. Arrington also played the villain on Seattle’s next touchdown drive. Taking over with just 31 seconds left in the first half, the Seahawks got 19 yards on the same sort of halftime draw to Robert Turbin that I would have belittled in the Thank You for Not Coaching days.3 They might kneel if that play gets stuffed, but after Wilson beat Jamie Collins on the edge and ran for 17 yards on the next play, the Seahawks were in business. Two plays later, Lockette beat Arrington on an out route and went for 23 yards, which would have been bad enough, but Arrington also threw in a face mask to move the ball from the New England 21-yard line to the 11-yard line. It cost the Patriots four points. With six seconds to go, the Seahawks surely would have kicked a field goal from the 21-yard line and gone into halftime down 14-10. Instead, with the ball just 11 yards away from the end zone, they threw a jump ball to Matthews for an easy score. The coverage there belonged to Logan Ryan, who bizarrely played off coverage, giving Matthews a free release, and then backpedaled three yards deep into the end zone to give Matthews a totally unrestricted catch for the score. If anything, given the time constraints, the Patriots’ defensive backs should have mugged the Seattle receivers, forcing the remaining time off the clock while preventing the Seahawks from catching the football. New England would have picked up a holding or pass interference penalty, but with no time remaining, Seattle would have been forced to kick a field goal. Matthews also had a 45-yard catch over Arrington after halftime before the Patriots finally put their embattled cornerback out of his misery and replaced him with Butler. The Patriots then shifted their defense around, with the 6-foot-4 Browner coming off his assignment on Kearse to match up with Matthews. The schematic shift, requested by Browner on the sideline, brought Matthews’s stunning game to a halt. After catching each of his first three targets against Arrington and Ryan for a total of 100 yards and a touchdown, he caught a nine-yard curl route against Browner on the first play of the next drive before going silent the rest of the way, only surfacing in the fourth quarter to be targeted on a bomb by Wilson that Browner knocked away. For a guy who hadn’t touched an NFL football on a meaningful play before the NFC Championship Game, though, Matthews sure has made an impact. He saved Seattle’s season by recovering the onside kick against Green Bay and helped stake out a lead with big plays here. A fringe player before January, Matthews has likely ensured himself an NFL career by what he’s done over the past month. Just as the Seahawks took advantage of Arrington and Ryan, the Patriots went after Seattle’s weaker links at cornerback and had success. While that was likely going to be targeting Seattle slot cornerback Jeremy Lane, he suffered a grotesque arm injury while being tackled at the end of his first-quarter interception and had to leave the game.4 That forced starting corner Byron Maxwell, who typically plays outside, into the slot, and pushed Tharold Simon into the game to fill in on the outside for Maxwell. I suspect the Patriots were already running a game plan designed to exploit Lane, but the injury shuffling just made things that much easier for New England. The Patriots picked on them both, with Simon getting the bulk of the attention. He was in coverage on two of Brady’s four touchdown passes, with Brandon LaFell beating him in the first quarter on a slant before Julian Edelman got him on a whirl route for the game-winning score in the fourth quarter. Edelman beat Simon even worse on a whirl route on the previous drive for what should have been a touchdown, but Brady overthrew the pass. Danny Amendola would find the soft spot in Seattle’s zones on the next play for a four-yard touchdown. Brady’s other touchdown came on a fade to Rob Gronkowski, who was matched up in man coverage against linebacker K.J. Wright and repeatedly beat that matchup for positive plays. Gronkowski spent a surprising amount of time matched up early split out as the world’s biggest decoy against Richard Sherman, but as the game wore on, he ended up in matchups against linebackers and safety Kam Chancellor and found them more to his liking. He finished with only six catches for 68 yards, a relatively quiet day for New England’s star tight end, but the touchdown catch was more than enough for the Patriots. Instead, the Patriots really attacked the Seahawks defense with a lot of the route combinations and concepts I brought up in the Super Bowl preview. They ran the slant-flat route combo over and over again, most notably on the LaFell touchdown. The Patriots added a wrinkle on that touchdown by sneaking in a quick play-action fake to LeGarrette Blount in the backfield, a move that kept linebacker Bobby Wagner in the middle of the field and prevented him from fanning out into his zone, leaving Brady just enough of a throwing lane on the slant. With Maxwell in the slot, the Patriots repeatedly brought receivers like Amendola and Edelman in motion and had them run flat routes to take advantage of Maxwell’s limited horizontal mobility. The Patriots also mixed in a few other combinations with their flat routes, including a wheel-flat combination with Gronkowski in the slot that generated a first down, and then a curl-flat combo where Amendola juked out Maxwell after making the catch before sprinting forward for 11 yards. They did the same thing when they could isolate Simon in man coverage, with Edelman beating Simon on a shallow cross and eluding his desperate tackle attempt to run for 23 yards. The other key component to the New England passing attack was Shane Vereen. The impending free agent made his presence known with an 11-catch, 64-yard performance that highlighted his versatility and importance to the scheme. The Patriots used Vereen in many of the clear-out route combinations they ran with Aaron Hernandez and Wes Welker when these teams played in 2012, with a receiver running up the seam to occupy a safety while Vereen took in a swing pass or ran an option route against the linebackers in front of them. The Patriots also split Vereen out and had him beat Seattle’s weaker links one-on-one. Seattle got so frustrated that it sent over Earl Thomas to cover Vereen in man coverage, and while Brady stared Vereen down for a moment at the snap, it served only to fool the Seahawks into thinking that Brady wasn’t planning on going to Gronkowski on that touchdown. Chancellor filled in for Thomas as the deep safety on the play, and while he’s a big hitter, Chancellor wasn’t quick enough to help the overmatched Wright. Thomas also took a late hit penalty on Vereen in the fourth quarter that foolishly cost his team 15 yards. The Seahawks didn’t really make adjustments to the New England offense as much as they just rose and fell upon the impact of their pass rush. Seattle got little pressure early before Michael Bennett began to take over. Lining Bennett up on the interior for most downs proved to be a genius move by outgoing Seahawks defensive coordinator Dan Quinn, as Bennett was far too quick for Patriots center Bryan Stork and guards Dan Connolly and Ryan Wendell. The Patriots also struggled with Bennett playing tackle-end games with the guys around him, as Bennett did when he ran a delayed twist around the end and forced Brady into an errant throw that was intercepted by Lane in the end zone. Bennett finished with four quarterback knockdowns, and while he didn’t have a sack or a tackle for loss, he disrupted and shifted so many Patriots plays during the first three quarters that he would have been my pick as MVP with a Seattle win. It was an echo of what Justin Tuck did on the interior against the Patriots during his two Super Bowl wins over New England. Bennett wasn’t as effective after Cliff Avril went out in the second half with a concussion, and in the fourth quarter, Brady took a coverage sack from Bruce Irvin on his first play and then went 13-of-15 for 124 yards and two touchdowns on his final two meaningful drives. In the end, the injury concerns surrounding the Legion of Boom proved to be mostly irrelevant. Despite the confirmation of reports before the game that Thomas had both torn his labrum and dislocated his shoulder, while Sherman had torn ligaments in his elbow in the NFC Championship Game, the stars in the Seattle defensive backfield didn’t seem to have any tackling issues. The Patriots didn’t challenge Sherman whatsoever, throwing a lone pass at him on the first play of the game as a checkdown to Gronkowski for two yards. Likewise, the Seahawks stayed away from Revis, who almost entirely shut down Baldwin. Baldwin’s lone target was a three-yard touchdown on a play where Revis was picked in coverage by the umpire. Baldwin responded to the score with a touchdown celebration that would have inspired hundreds of thousands of think pieces, anti–think pieces, and local news chatter had it been a touchdown celebration from Lynch, but because it was Baldwin, everybody forgot about it two minutes after it happened. This also cost the Seahawks 15 yards. 1. Julian Edelman extends a drive with a miraculous third-and-14 catch for the Patriots. It might also be fair to characterize this one as the play Edelman forgot, given that just about everyone who saw it immediately thought he had a concussion. Edelman apparently never went through concussion testing, even though independent doctors were calling down from the booth insisting that he be tested. The Patriots allowed Edelman to talk to the media after the game, suggesting he had not been tested even after the victory had been confirmed. Edelman’s catch might have kept the game alive for the Patriots. Their win expectancy was at its absolute lowest before the play, down all the way to 9 percent before Brady hit his throw. Much of the route occurs off-camera and the NFL hasn’t yet uploaded coaches’ film, so I can’t really break down what happened, but this was a play of quiet importance. If the Patriots don’t get 14 yards there, they punt with 11 minutes and have to hope for another stop. Instead, they hold on to the football with a new set of downs near midfield, get the Thomas late hit to advance the ball 15 yards further on the next play, and score within three minutes to make it a one-possession game again. 2. Rob Ninkovich stuffs Lynch in the backfield for a loss on third-and-1. This shouldn’t have had any bearing on Carroll and Bevell’s decision-making later in the game, but when the Seahawks did run the ball on third-and-1 in the red zone in the third quarter, the Patriots came up with a stuff that might have saved a touchdown. After Lynch failed to pick up the yard, Carroll sent out Steven Hauschka to kick a 27-yard field goal that gave Seattle a 17-14 lead with 26 minutes to go. Those four points would come in handy later in the game. The Patriots overload the right side of the line in a designed attempt to cut out the zone-read. Vince Wilfork attacks the right tackle, Justin Britt, at the snap, allowing Ninkovich a free release into the backfield to try to cut off Lynch before he gets past the line of scrimmage. In doing so, the Patriots are willing to match one defensive tackle and Jamie Collins, who sprinted at Max Unger at the snap in running situations throughout the game, against all three of Seattle’s interior linemen. They’re basically daring Lynch to beat Ninkovich through the hole. He doesn’t. The beauty of it for the Patriots is that they leave Hightower to the right of Ninkovich, so even as Ninkovich crashes inside against the Lynch handoff, they’re still protected if Wilson sees the Ninkovich push and decides to keep the ball himself. In truth, Wilson probably should have checked out of this play; it’s just too easy for Ninkovich to slice into the backfield and make a play without a tight end or Britt bothering him on that side. That’s an incredible play by Hightower in a spot where the margin for error is basically nil. First, he fights off a block from one of the best left tackles in football, Russell Okung. That gives him a tiny window in which to tackle Lynch, arguably the most difficult man in football to bring down, and Lynch is running away from a basically standstill Hightower at full speed. Hightower somehow manages to dive at Lynch’s knees and trip him up, with Akeem Ayers diving on a falling Lynch as the Seahawks star goes down. If Hightower doesn’t get off Okung’s block, it’s a touchdown. If Hightower doesn’t get enough of a swat at Lynch’s knees, he either runs in for a touchdown or Ayers’s tackle drags him into the end zone. Sure, the Seahawks made the wrong call to throw the football on the next play. Seattle fans are going to spend the rest of their lives stewing over that call. As easy as it is to say the Seahawks lost this game because of their own mistakes, the Patriots had to make some incredible plays to win. 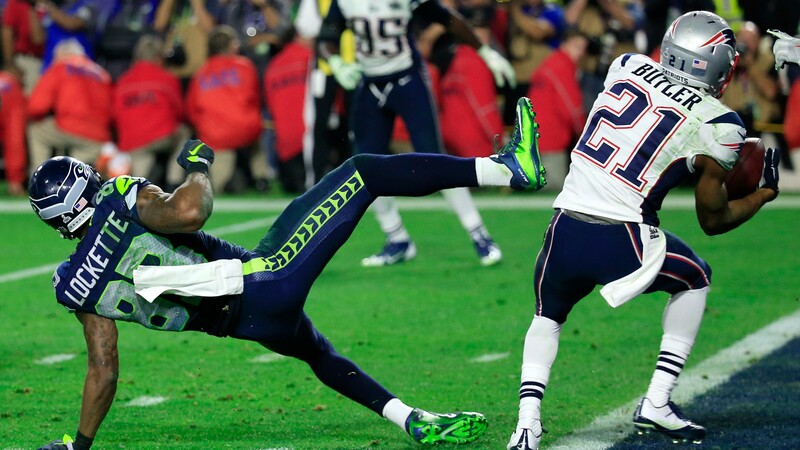 Hightower’s Super Bowl–saving tackle was one of the plays that will unfairly get lost in the shuffle. In fact, he might very well have had Lynch open coming out of the backfield on a wheel route on the other side of the field. It was weird to see the likes of Tony Dungy criticizing the decision and pointing out that Lynch had run for four yards on the previous play as proof Seattle could get a yard on second down, given that just about every coach in football would follow your typical four-yard run on third-and-5 in the red zone with a field goal on fourth-and-1 instead of making that same argument. Just like Mike McCarthy did in the NFC Championship Game. The play worked. If they were really committed to trying to move the ball, why not run a throw downfield or a zone-read run with Wilson instead of a draw? (1) The NFL still said Lane was “doubtful” to return, because of course it did; and (2) there’s no way in hell I’m linking to an image of that injury. Super Bowl Run & Shootaround: So You Want to Play With Magic?